Heavy snow and early spring rainfall generated substantial amounts of runoff and flooding in the upper part of the Missouri River Basin in 2011. Spring runoff in the upper and middle parts of the basin exceeded the storage capacity of the Missouri River reservoirs and unprecedented amounts of water were released into the lower parts of the basin resulting in record floods from June through September on the Missouri River in Iowa and Nebraska and extending into Kansas and Missouri. Runoff from the Missouri River Basin in April through September 2011 was 8,440,000 hectare meters (68,400,000 acre feet) and was only exceeded during flooding in 1993 when runoff was 11,200,000 hectare meters (90,700,000 acre feet). Nitrate and total phosphorus concentrations in the Missouri River and selected tributaries in April through September, 2011 generally were within the expected range of concentrations measured during the last 30 years. Substantial discharge from the upper and middle parts of the Missouri River Basin resulted in nitrate concentrations decreasing in the lower Missouri River beginning in June. Concentrations of nitrate in water entering the Mississippi River from the Missouri River were less in 2011 than in 1993, but total phosphorus concentrations entering the Mississippi River were substantially greater in 2011 than in 1993. The Missouri River transported an estimated 79,600 megagrams of nitrate and 38,000 megagrams of total phosphorus to the Mississippi River from April through September 2011. The nitrate flux in 2011 was less than 20 percent of the combined total from the Upper Mississippi and Missouri River Basins. In contrast, the total phosphorus flux of 38,000 megagrams from the Missouri River constituted about 39 percent of the combined total from the Upper Mississippi and Missouri River Basins during April through September 2011. Substantially more nitrate but less total phosphorus was transported from the Missouri River Basin during the historic 1993 than during the 2011 flood. Greater runoff from the lower part of the basin contributed to the greater nitrate transport in 1993. In addition to the differing amounts of runoff and the source of flood waters, changes in land use, and management practices are additional factors that may have contributed to the difference in nitrate and total phosphorus flux between the 1993 and 2011 floods. 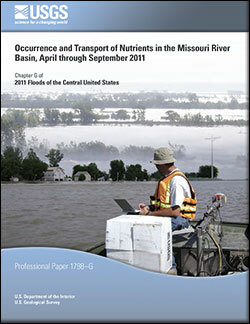 Kalkhoff, S.J., 2013, Occurrence and transport of nutrients in the Missouri River Basin, April through September 2011: U.S. Geological Professional Paper 1798–G, 23 p., https://pubs.usgs.gov/pp/1798g/.